This main Strawberry Seeds page serves as a hub for anyone looking to learn about or purchase strawberry seeds. This page will help you understand everything you need to about growing strawberry plants from seed. If you don’t know where to buy strawberry seeds, you can visit our list of suppliers and seed companies who offer them for sale. Following that, we cover how to plant strawberry seeds and grow strawberry plants from seeds. And, of course, you can also read up on the fascinating details and information regarding strawberry seeds and what makes them unique. As new information is added, links will be posted at the bottom of this page to the new strawberry seed information. Be sure to check back! Growing strawberry plants from seed is more difficult than simply buying strawberry plants. But, it can be much more rewarding as well. Once you have strawberry plant growing, refer to our Growing Strawberries page for guidance on how to successfully produce a strawberry crop. Growing strawberries from seed, of course, begins with selection of your preferred Strawberry Varieties. Once you have selected the strawberry cultivar that is right for your garden and purchase the strawberry seeds, you are ready to plant. 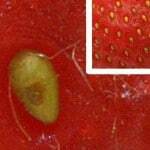 Be aware, however, that strawberry seeds from most hybrid cultivars will not reproduce true to form. Alpine varieties and heirloom seeds usually will (along with a few of the new F1 cultivars), so factor that in when planting strawberry seeds. Many strawberry seeds need to be cold treated to encourage germination. If your selected seeds require this, fear not. It is easy. Simply wrap your seeds, put them in an airtight container, and place them in a freezer. This simulates winter conditions, and the warming period lets the seed know it is time to come to life. After keeping the strawberry seeds below freezing for two to four weeks, remove the seeds from the freezer. Leave them in the jar or container as they gradually warm up to room temperature. Once your strawberry seeds are at room temperature and are ready plant, you need to create a hospitable place for your seeds to begin their journey to planthood. A seed tray works well. Obtain a seed tray and prepare it. A good mix for starting strawberry seeds is 3 parts peat to 1 part organic-rich soil. Spread this out in your seed tray to a depth of about one half of an inch. Moisten the mixture with water until it is uniformly damp. Sprinkle your strawberry seeds over the damp mixture and then cover the seeds with a very thin dusting of peat moss. Ensure that the strawberry seeds are not completely covered and are exposed to light. Keep them indoors in a well-lighted room and in direct sunlight, if possible. In two to three weeks, the strawberry seeds should germinate. Keep the soil moist well-lighted. Warmth can help the seeds germinate, so the top of a refrigerator or on a bottom heat pad can be suitable places for germination. If the strawberry plant seedlings aren’t in direct sunlight with supplemental light, consider providing additional artificial light. A fluorescent shop light or grow light will do the trick. Position the light source 3 to 4 inches from the seedlings, and raise the light as the strawberry plants grow. If the strawberry seeds sprout too close to each other, thin them when they are between 1 and 2 inches tall, keeping the biggest and most vigorous seedlings. Gently transfer the strawberry seedlings to larger containers or pots after they gain their 3rd leaves. If weather allows, the strawberry seedlings can be planted directly outside, or the plants in the containers can be replanted outside. If the strawberry seeds were started indoors, the young strawberry plants need to be hardened off prior to planting outside. When the temperature rises into the 50s, begin taking the plants outside in the shade for several hours each day. Gradually increase the time the plants are outdoors, eventually leaving them outside overnight as the temperature allows. Begin moving them into the sun for increasing periods of time to finish the hardening off process prior to planting. This ensures your plants won’t be damaged or killed by their environmental changes. It is fun to grow strawberries from seed! 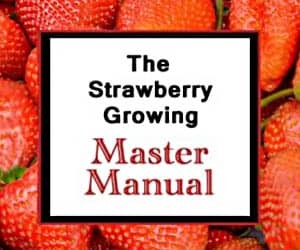 When you are ready to plant outside, be sure to reference the Growing Strawberries page. Put your ripe strawberries into a household blender. Add one cup of water to the strawberries in the blender and blend on high for 3 to 5 seconds. Try not to exceed 5 seconds of blending time, or the seeds may be damaged. Allow the components to sit for a minute or two. The viable seeds will sink and the unviable seeds will float along with the strawberry pulp. After the good seeds settle to the bottom, pour off the bad seeds and fruit pulp with the water. Rinse the seeds and then transfer them to a paper towel (or low-heat dehydrator) to dry. When dry, store them in a cool, dry place. If you prefer to use a non-blender method, you can try an alternative strawberry seed saving method. If you dehydrate a strawberry (or let it dry completely), you can use your thumb and forefinger to rub the strawberry so that the seeds fall off. Separate the seeds from the chaff and store in a cool, dry place. Or, if you prefer still another method, you can also use a sieve. Take a strawberry, press the pulpy part through the sieve, and the seeds should be left in the sieve. Rinse the seeds, dry, and store the strawberry seeds for future planting. The relationship of birds and strawberries is likely due to the prevalence of strawberry plants across the temperate world. The birds, obviously, love to eat strawberries, and the seeds generally pass through their digestive tracts intact and in good shape. As the birds defecate, they spread viable strawberry seeds far and wide. The tasty strawberries are also unique in another way. Scour the earth all you want to, but you’ll not find another fruit with its seeds on its exterior surface! Strawberry seeds give rise to the strawberry plants that produce the strawberries we all love. We think everyone should have a fond affection for the little fellows (unless, of course, you get a strawberry seed stuck in a tooth or between your gums). If you have any questions, feel free to leave a comment. And, be sure to check back as additional information is added and linked below. Looking for pineberry seeds for sale? If you want to grow pineberries or grow pineberries from seed, you should read this first before buying pineberry seeds online. Also has links to pineberry varieties & growing pineberries information. I started to save seed from my strawberries and it’s been a fun experience trying my hand to grow the. Though in conversation someone told me I could never have heirloom seeds because I don’t know my beginning variety and I let them open pollinate. Is this technicality true? If you did not have any other varieties of strawberry plants near and your initial variety was a pure species (not a hybrid as most are), then you can consider the seeds heirloom. If you don’t know your beginning strawberry variety, it is likely that you have saved hybrid seeds, and your friend is correct. Either way, good luck! Is it too late to germinate seeds in June if I don’t expect to get fruit the same year? Will the plant be mature enough to survive winter? Thanks. Yes, you should still be able to germinate. As long as they are cared for prior to freezing temperatures, they should survive the winter also. Good luck! If you are careful, you can very gently transplant the other strawberry seedlings into new pots and grow them as well! Good luck! Yesterday night I put strawberry seeds in the freezer. When should I take them out? When I do how long should the plants be put into soil germinate and then big enough to be planted outside? This guide will help you through the whole process. Good luck! I have recently bought organic strawberries(with the intent to extract seeds from them in attempt to grow my own plants) with what I figured to be a better chouse for strawberry seeds. I froze a couple of strawberries and then plucked the “fruit” off of them. Now that I have plucked a couple hundred seeds and am allowing them to dry I am fearing that it could still very well be a hybrid, just grown organic. Is it possible that these will still grow into plants and produce good fruit or do you have to buy seeds or heirloom plants/seeds? 2nd question is are all strawberry perennials or do they die over winter? Virtually all the commercial strawberries are hybrids, so the plants you grow from those seeds are a genetic lottery. Most folks that play, unfortunately, don’t win. It is possible to get plants that produce good fruit, but it isn’t probable. And, yes, strawberries are perennials and will grow for several years if cared for properly. Good luck! Hi. I successfully grew a Strawberry plant from a seed off a Strawberry I ate. It has been very gratifying to accomplish this! 🙂 My plant is almost a year old now. It took a LONG time to germinate (I kept the seeds on a wet paper towel inside a plastic bag until they sprouted, and then put them in soil). They seem to be doing well for the most part, grow new leaves every few days from the center, and have even grown two runners. It is in a pot inside. My questions are: why are the older leaves starting to brown & dry on the edges, and, what do I do with the runners, since the plant is in a pot? If I cut them off, can I start a new plant from them? If so, which part do I plant in the dirt? Should I let roots develop in a glass of water first, or use a rooting compound? Thanks!! Congratulations on your strawberry germinating success! Older leaves will often die back as they age, so that may be all that it is. The plant could also have a fungal infection, not be getting enough light, or have too much or too little water. Additionally, nutrient deficiencies could also be causing it. You can start new pots with the runners. See here for details. And, good luck! Hey guys. I think I must be a god or something because I bought my seeds at Target for a dollar with a small dirt pallet and a tiny pot. Its been winter and I kept it up in my windowsill and after 2 weeks I thought it would be frosted, I never even knew they like cold to germinate. I then kept it in the light on my warm cable box, under a lamp light, not even fluorescent. I named him Mephistopheles and I water him daily and 2 other sprouts are in the pot now. He’s been alive for a full month. I live in west Mich. and I have a small hydroponic setup in the basement that works well.What type of strawberry would you reccomend for this. Thanks for your site.Its got all one needs to do well. The best varieties of strawberries for indoor hydroponic growing are the day neutral varieties. Of those, Tribute and Tristar are two of the most popular. Good luck! Your site is amazing. So informative and you respond as to show you love to share your knowledge….indeed with people from all over the world. I have learned how better to care for my berries in Maine. And I will carry seeds to Dominica, as my friends have tried there but I think they need my wild variety.thank you. Thank you for your kind words! Good luck! I tried planting my first strawberry plants this year however, we didn’t get one strawberry from them due to pests – either the whole berry would be gone, or it would be destroyed by bite/peck marks. I of course don’t want to use any chemicals – are there any other suggestions you have to help ward off birds and other pests from eating them? I’m sorry to hear about your strawberry patch invaders! Try bird netting to keep the critters out, and apply diatomaceous earth liberally to keep the insects unhappy. Good luck! I bought the seeds from ebay for blue strawberries. I know they might not be real but I bought them just in case. I planted 23 seeds in a pot 6 weeks ago. Still nothing has germinated. Is there any hope that these will still germinate? Do you have any advice on how I can be more successful with the remaining seeds that I have left? Thanks in advance. Unfortunately, whomever it was that sold you the seeds is either a shyster or duped themselves. There are no blue strawberries to date, and the seeds may not even be viable. I’d recommend reviewing how to germinate them and then trying the rest of them. Sorry! Hi, I am trying to figure out when the best time to start strawberry seeds would be. Should I start them in spring or before like in fall or does it matter?? It depends on when you want to plant them. If you want to plant them outdoors in the fall, it is best to start them in the spring to allow them time to grow into sufficiently hardy plants prior to hardening off and planting outdoors. If you want to have plants to plant out in the spring, and you don’t mind managing them inside during the winter, you can plant them in the fall. Good luck! I had create a box where the temperature can be adjust. I want to put the seeds of strawberry inside the box. What i need to do to ensure the seed is growing well in 2 month or 3 month. Its ok if i use an alphine strawberry?? Or there is another suitable seed?? I really need your help sir..
Once the seeds germinate, they will grow into small strawberry plants. Alpines are a suitable choice. They have smaller, but very tasty, berries. Good luck! How long does a strawberry seed last? Say I put it in a glass jar, and want to plant it in 4 months, is it possible or will it get old and die? And can I plant and grow them in an aero garden on Thailand, and still get strawberries in winter time? All seeds lose viability over time, but some can last thousands of years. If a strawberry seed is viable to begin with, storing it in a glass jar for four months in a cool, dry place should be just fine. You can plant them and grow thin in aero gardens in Thailand if the climate is controlled (i.e. not too hot), and if you use a day-neutral cultivar, you can get strawberries all year long. Good luck! Do we take the seeds off the strawberries and plant them into the ground then put the soil on top of them? I live in Wyoming. Yes, you can do that. Good luck! Can you plant the seeds directly into the soil? If so, would you cover the seeds with soil or just scatter the seeds on top of the soil? See here for all your germination questions! And, good luck! I have purchased some Alpine seeds. I believed I could plant these in the ground. After reading here, I think I should start inside to germinate. Do I have the right idea? (I live in central Michigan). Yes, I would recommend starting them indoors, then transplanting them outside after they have established their roots. Good luck! Hello! I am having a berry-themed wedding at the end of the summer (I live in NY). I was hoping to provide strawberry seeds and instructions for growing as wedding favors. If planted in late summer/early fall, can they be grown indoors successfully until able to be moved outdoors in spring? Yes! Good luck, and congratulations! My friend lives in Brazil and doesn’t care for the strawberries. I wonder is ther any type of seed that can be bought online or I could ship from Ontario to him that may grow well? Yes. If she lives in an area where strawberries grow well, just about any other strawberry variety should at least grow there for her. Simply ship her seeds. Good luck! Im in the Caribbean and want to know what seeds to buy for this area, when to plant and can it be done in a pallet garden? Unfortunately, the Caribbean is too hot to optimally grow the temperate strawberry plants. If you still wish to try, choose any and give it a go. They can be grown in pallet gardens in temperate climates. Good luck! When should i start the seeds to have them ready for a fall planting? I would go ahead and germinate them. They are tiny and grow slowly at first, so planting now will let your plants be big enough to get a quick root-hold by September. Good luck! Hey I live in ohio are there certain kinds of strawberries that grow better in ohio? Yes! Look up Ohio on this page, and choose one of the recommended varieties. Good luck! How many seeds are needed for a strawberry plant? Theoretically, you just need one seed to grow a strawberry plant. However, strawberry seeds don’t always germinate. For more, see this on germinating strawberry seeds, and good luck! I’ve got Alpine White Soul, Alpine Yellow and Delicious Red seeds. Do I keep all of them in the freezer for the same time or do they differ? There will be slight differences between varieties, but, in general, you should be able to cold stratify them for approximately the same amount of time. Good luck!